Situated on the eastern side of Trevose Head, just west of Padstow, Harlyn Bay is a vast, wide beach of yellow sand and pebbles. It’s popular with amateur surfers, with many surf schools operating on this crescent-shaped cove. Sea kayaking is particularly popular here too. There are walking routes to Mother Ivey’s Bay and Trevose Head to explore, taking in the spectacularly dramatic rocky coastline and offering ample distance to wear even the most energetic of dogs out. Fistral Beach is famed for its UK surfing credentials. It is one of the world's most famous surfing hotspots, while the beach itself is backed by impressive sand dunes that are a hive of adventure for people and pets alike. The two headlands that encompass this beach funnel in sizeable hollow waves that usually reach between six to eight feet in height. Fistral Beach is home to top UK surfing competitions such as the UK Pro Surf Tour and the BUSA Championships, making it apt for beginners, professionals, and spectators alike. Just in front of Gorran Haven village, is its name-sake, picturesque sandy beach. This crescent-shaped stretch is largely sheltered by cliffs and overlooking village townhouses. The proximity of this beach to the town means that there are numerous facilities nearby, though it should be pointed out that the beach has no lifeguards. Gorran Haven beach features a small harbour and stone pier that was erected in the 19th century and visitors can enjoy seeing the small flocks of fishing boats hard at work on the Cornish coastline when the sands are covered at high tide. Sometimes called “Polly Joke”, there’s nothing to laugh at when it comes to Porth Joke Beach (and not much to laugh at in that over-used observation either). This unique beach is a sandy cove that is sandwiched between two headlands and dotted with small rock formations. Unlike many of its counterparts, this beach is far longer (from shore to sea) than it is wide (from side to side), and is home to an elegant stream, as well as rock pools and caves. Porth Joke Beach is one of the quieter beaches you will find in Cornwall, despite being a mere five miles away from the ever-popular Torquay. 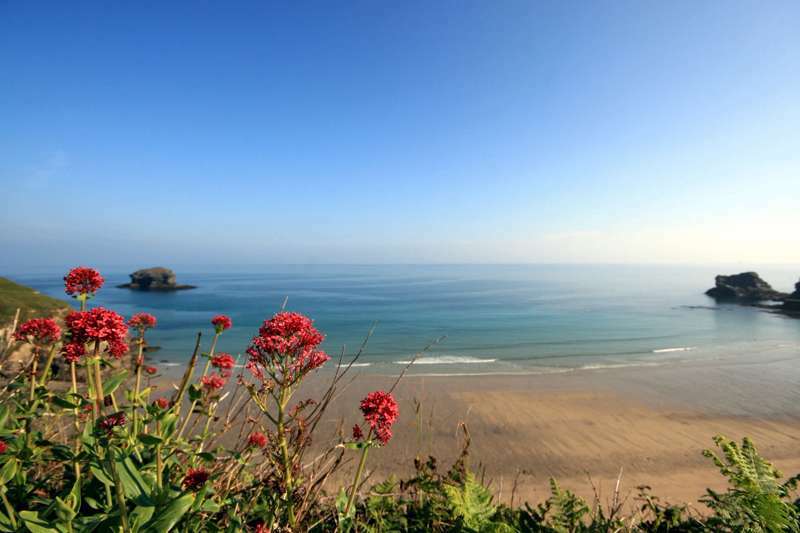 Located approximately halfway between Port Isaac and Tintagel, Tregardock Beach is oftentimes empty and unoccupied. It is located at the end of a long footpath (with very limited car parking nearby) and requires a short descent down some rocks to get there (let the dog go first). Tregardock Beach is, therefore, a little difficult for many to get to but the result for those who make the effort is a far quieter slice of sand than elsewhere. At high tide, the beach will disappear, so check the tide times, but at low tide, you will find a fine beach that is littered with rocks, cliffs, caves, and even a waterfall. Most of Hayle's famed 'thee miles of golden sand' is nothing but open beach. Upton Towans Beach joins up with its neighbouring Hayle beaches at low tide, resulting in an expensive stretch of golden sand that has proved to be popular with kite buggy and sand yacht enthusiasts. The good thing about this golden stretch is that it rarely gets crowded, simply due to its sheer size. This makes it ideal for long walks with the dog and extensive games of fetch no matter how far you can hurl a stick. Situated besides the 110-metre Dodman Point, Vault Beach is a crescent-shaped sandy bay that is hidden away by the vast green hills that encompass it. There is no lifeguard patrol here, though the sea is usually pretty calm for the most part. Though not officially recognised, the far end of this beach is used as a nudist beach so be sure to keep your pet well under control! Located on Tresco, the second biggest island of the Isles of Scilly, Appletree Bay is a tranquil and unspoiled stretch of almost a mile of soft, pale sand. These sands are complemented by the crystal clear waters of the Tresco Flats, giving the beach an almost tropical aesthetic. This untouched beach features gentle sweeping dunes and magnificent dunes. Its location on Tresco means that it is far, far quieter than any beach on the mainland. Pedn Vounder is a beautiful sandy beach, featuring crystal clear water and golden sand that is framed by the stunning cliffs of Treryn Dinas. The famous Logan Rock – a huge 70-tonne block of rectangular granite which can be rocked back and forth by (brave) people – can be found to the east end of the bay. Dogs are welcome and the walk from the car park to the rock is an ideal distance to wear you and your dog out before returning to camp. Mexico Towans is a beach situated within four miles of neighbouring beaches in the Hayle/ Towans area. The beach is very wide, though it is fairly remote, featuring no real access route for vehicles. Its sheer length makes it ideal for letting your dogs run around and have some sandy fun. There’s probably a reason it’s named after Mexico but I we're yet to discover why!